It is a momentous day in digital marketing. 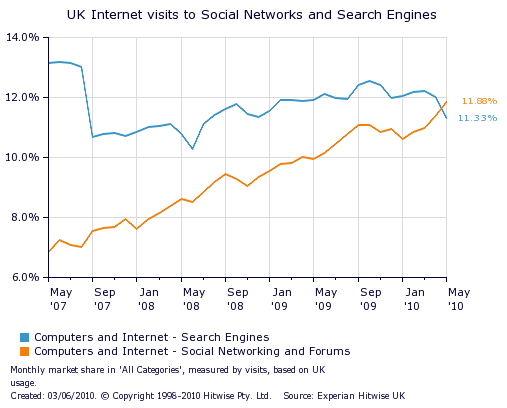 As tracked by Experian Hitwise traffic to UK websites from their Social Media category is higher than traffic from the Search Engines category. However what Hitwise don’t explain in the blog post is that they measure traffic in a very different way from what you might expect from an analytics package. Modern day browsing behaviour means that we very often have more than one tab open in our preferred browser (if not more than one browser open as I do as I type). UK Internet users very often check their Facebook feeds during the work day (some more than others) and when you refresh that page to update your feed this counts as a user action to Hitwise – something which inevitably inflates this figure. This isn’t a bad thing – it’s merely Hitwise’ way of measuring human behaviour rather than just clicks so it represents an interesting measure. For ThinkSearch this underlines the shift in emphasis for brands from traditional SEO marketing through to doing business in the social web and merely serves to underline the importance of ensuring your best practice SEO also embraces the benefits of the distribution and advocacy channel of Social Media which also often has direct benefits in the form of links to your website.